It’s the tropical rainy season here in northern Virginia, as it is for much of the east coast. Pounding rain and crashing thunderstorms are daily interspersed with periods of intense sunhine, resulting in a muggy, jungle-like atmosphere. Kiko, of course is distressed. (See Evading the Terrible Thunder Monster, April 2013.) Our once cocky, fearless little dog has become the the canine Woody Allen. Should a cloud cover the sun, however briefly, we’ll find Kiko hiding in a centrally located bathroom, cowering in a corner of the kitchen, or repeating a nervous circuit of the house. The Xanax prescribed by our vet just wasn’t doing the trick. 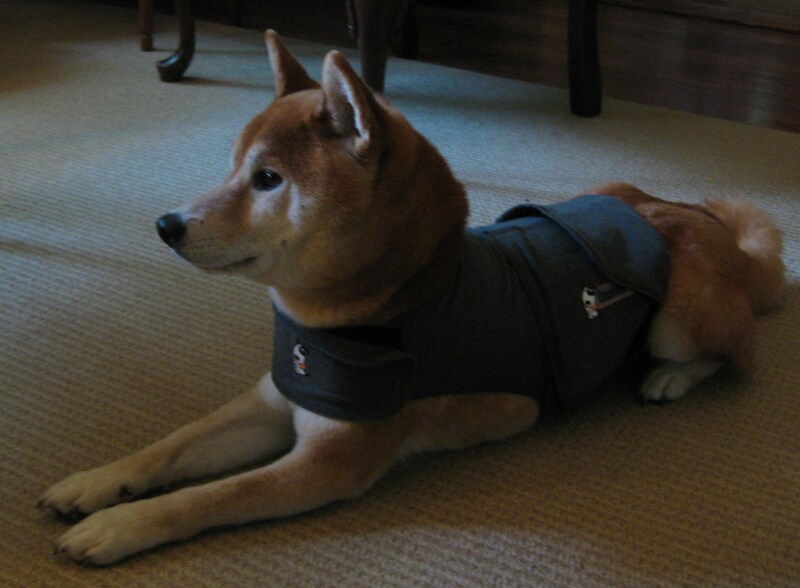 So, we tried the Thundershirt. And, I’m much relieved to say, it works. For tough situations, when combined with an increased dose of Xanax, it really works. Yesterday, July 4th, was just such a situation, easily one of the most miserable days of the year for Kiko. The celebratory fireworks of indepence are, to our dog, simply another, perhaps even more evil, manisfestation of thunder. When he heard neighborhood children ominously blowing horns and snapping a few poppers, his apprehension took root. By the time the first local firecracker had sounded, well before dark, he was clearly anticipating the world’s end. I put him in his Thundershirt by late afternoon. It averted the shaking and quaking he usually experiences during his periods of anxiety. At 8:00, Kiko dutifully swallowed the Xanax (.5 mg) in a bit of cheese. My husband and daughter, both devoted connoisseurs of fireworks, collected their extensive stash of explosives and headed out to join the neighborhood conflagration. I retreated to the den of safety I had prepared for me and my dog: our family room, with the blinds drawn and draperies pulled (to keep out any flashes of light). Kiko, bundled snuggly in his Thundershirt, eagerly cuddled up with me on the sofa. I tucked several pillows around us for good measure, poured a glass of wine (a bit of helpful self-medication) turned up the ceiling fan, and tuned into the first episode of Boardwalk Empire, which I had been wanting to sample. As the sounds of pounding, popping, whizzing, cracking and booming increased outside, Kiko breathed evenly and appeared to be very nearly content. H and D witnessed and participated in a varied and prodigious display of fireworks, I drank a toast to Prohibition and Steve Buscemi, and enjoyed the sweet closeness of the loving lap dog I often wish Kiko really were. Happy 5th of July to everyone, especially to those who share their lives with anxious dogs! 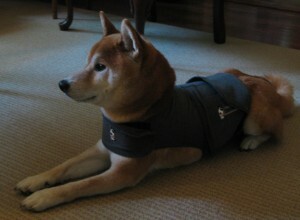 Kiko, in his Thundershirt, yesterday afternoon. It’s obvious, by the position of his ears, that he’s already alarmed. 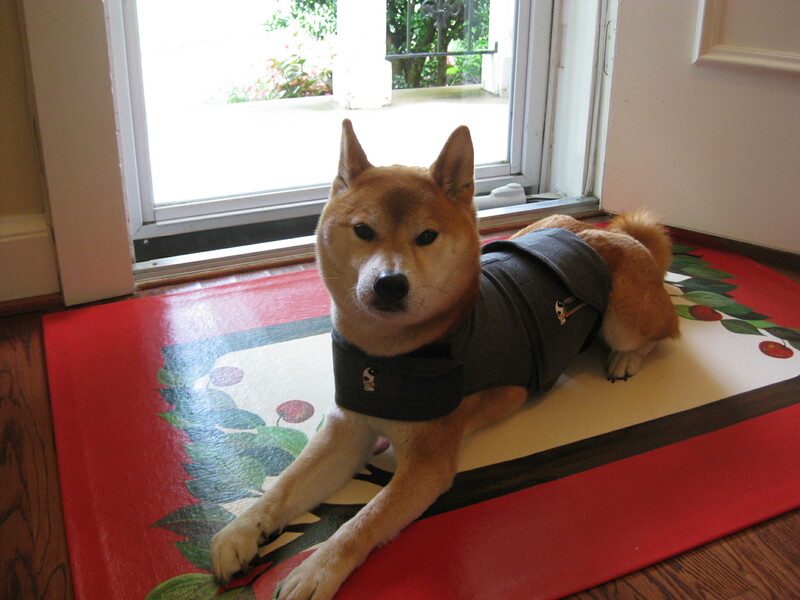 The Thundershirt wraps tightly, to mimic a close hug.